What is the source of the uniquely Western way of war, the persistent militarism that has made Europe the site of bloodshed throughout history and secured the dominance of the West over the rest of the world? The answer, Doyne Dawson persuasively argues in this groundbreaking new book, is to be found in the very bedrock of Western civilization: ancient Greece and Rome.The Origins of Western Warfare begins with an overview of primitive warfare, showing how the main motivations of prehistoric combat?revenge and honor?set the tone for Greek thinking about questions of war and morality. These ideas, especially as later developed by the Romans, ensured the emergence of a distinctive Western tradition of warfare: dynamic, aggressive, and devastatingly successful when turned against non-Western cultures.Dawson identifies key factors that led Western culture down this particular path. First, the Greeks argued that war could be justified as an instrument of human and divine justice, securing the social and cosmic order. Second, war was seen as a rational instrument of foreign policy. This, probably the most original contribution of the Greeks to military thought, was articulated as early as the fifth century b.c. 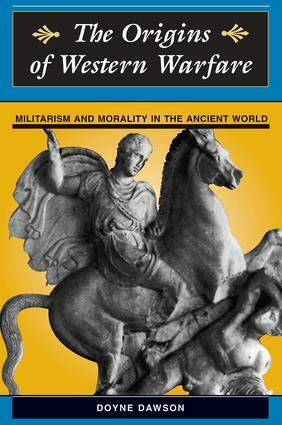 Finally, Greek military thought was dominated by the principle of ?civic militarism,? in which the ideal state is based upon self-governing citizens trained and armed for war.The Roman version of civic militarism became thoroughly imperial in spirit, and in general, the Romans successfully modified these Greek ideas to serve their expansionist policies. At the end of antiquity, these traditions were passed on to medieval Europe, forming the basis for the just war doctrines of the Church. Later, in early modern Europe, they were fully revived, systematized, and given a basis in natural law?to the benefit of absolute monarchs. For centuries this neoclassical synthesis served the needs of European elites, and echoes of it are still heard in contemporary justifications for war.Providing a careful reconsideration of what the classical sources tell us about Western thinking on fundamental questions of war and peace, The Origins of Western Warfare makes a lasting contribution to our understanding of one of the most persistent and troubling aspects of Western culture.